Kalymnos is among the most recently discovered climbers� destinations, offering some of the most interesting routes for rock climbers all over the world. With 45 organized sectors at the moment available, fully equipped and safe (lime stone rocks � 550 routes varying between 1 to 7 slabs/pitches � difficulty options from 4c to 9a), Kalymnos is a constantly growing climbers� international spot � the greatest part of the island�s rocky expanses still has to be exploited! -Within the Residence�s area a motorbike-rent shop is located, offering latest models of bikes and scooters at very intereting prices and including special offers and discounts. Check out their web page for online booking and more info. -	Right above Massouri, and extending towards Myrties (just a few minutes on foot from Massouri), sectors and routes can be reached, such as Kalydna, Poets, Iannis, Zeus and Gerakios. For all of these routes Massouri is the closest point. -	Just a few minutes from Massouri, on the way to Armeos (the distance is really irrelevant, can be reached on foot or by bike), Sectors and routes such as Panorama, Grande Grotta, Spartacus, Afternoon, Jurassik Park, and Mouses can be easily and shortly reached. -	On the same route, always on the main road network of the island and up to Kastelli, at a distance that will never exceed 15 minutes by bike, other very exciting routes can be found, Iliada, Odysssey (below this route the Municipal Climbing Kiosk, where you can get all the most recent updates on routes and sectors plus printed material, is also located), Ocean Dream, School, North Cape just to mention a few of them. 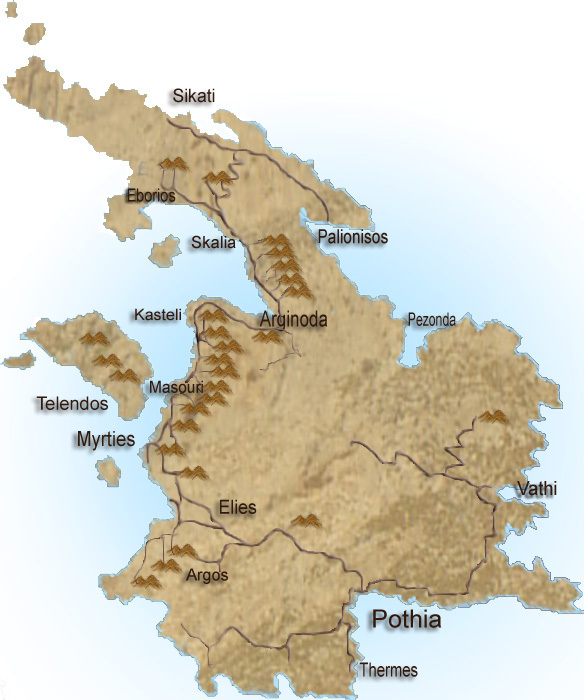 -	-	From that point on the road will lead to more quiet and isolated villages and spots of the island such as Emporios , Arginonta and Skalia. Yet all of these places really deserve a visit in the first place for the astonishing sightseeing they all can offer, as well as the lovely beaches and clear water that can be found there. By motorbike, the most distant among all these places will hardly require half an hour of time to be reached. Along those locations the routes to sectors such as Sea Breeze, Grey Zone, Helvetia, Start, Belgian Chocolates, Noufaro, Black Forest, Galatiani, Cave, The Seaside Kitchen, Skalia, Palace, Baby House, Kreissaal. Francois Guillot, are easily accessible. -	Among the villages and spots in the above mentioned zone, Massouri is certainly the biggest and better equipped center, in terms of info-shops, car & bike rentals etc, and Ibiscus is only steps far from any of them. By any mean, Massouri is the most convenient starting point for climbers wishing to explore and discover the ideal combination of adventure, weather conditions and sightseeing Kalymnos and its routes offer.